Ever since we were little, we were taught the importance of preparation and how it undoubtedly leads to success. Not only will preparation help you ace that calc final (as I’m sure you will) but preparing your meals at the beginning of the week can help make living life on your own a whole lot easier! If you have access to a kitchen, all you need is some tupperware and you are set to go. Meal preparation, or meal prep for short, refers to the practice of preparing all your meals for the upcoming week at one time. Start by planning what it is you want to eat. For example, you can alternate between chicken and salmon, rice and quinoa, and broccoli and asparagus (as a health freak these are some of my favorite foods, sorry) so you don’t get bored eating the same foods throughout the week. Then, buy enough of each for one seven days and on Sunday night, spend a couple hours cooking your food in bulk and dividing it throughout different tupperware dishes which you can safely store in your freezer. And ta-da! you no longer have to worry about cooking, or buying your food for the rest of the week. You just simply grab a meal from your freezer, pop it in your microwave, and enjoy! 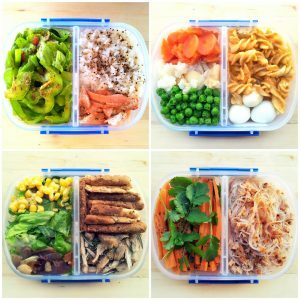 Not only does this save time, but it can also help you regulate what you’re eating to prevent unwanted weight gain (which is unfortunately a common occurrence among freshman and upperclassman alike). And hey, who doesn’t absolutely love a home cooked meal?